In Brian's Minnesota game column, he speculated about the potential for the "Fritz" (sure) formation--the diamond formation with Denard and Devin Gardner on the field at the same time--that Michigan used. In particular, he wondered whether or not that would be a precursor to the introduction of the triple option. 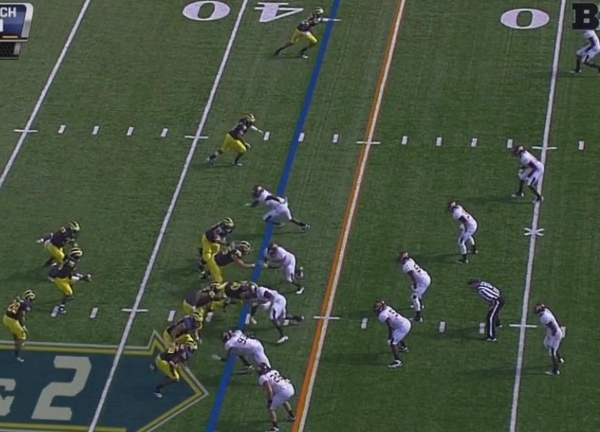 In reality, Michigan already tipped their hand with the triple option against Minnesota. It's 2nd and 2 in the third quarter. Michigan is in their two-back set with two receivers to Denard's left and Koger lined up on the right side of the offensive line. Minnesota is in its 4-3 front with basically 9 defenders in the box. 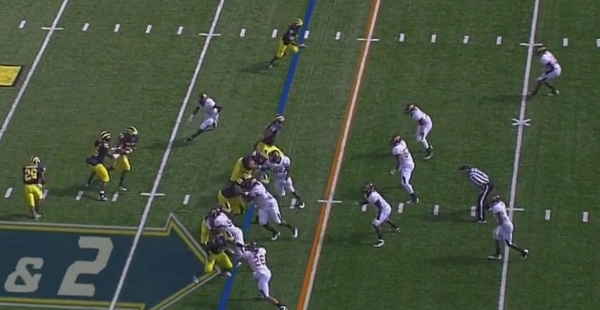 On the snap, you can see that the weakside defensive end is unblocked like he would be in a traditional zone read. 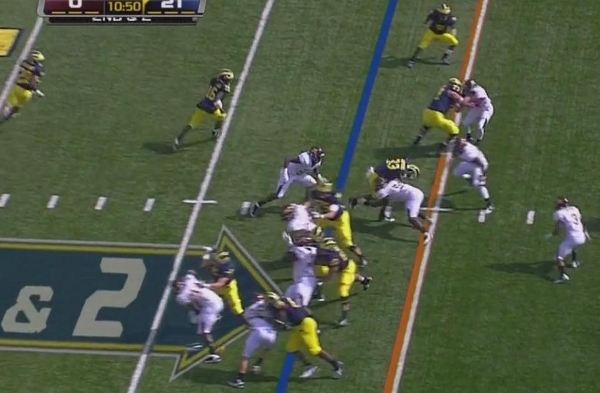 Stephen Hopkins is approaching the mesh point with Denard. 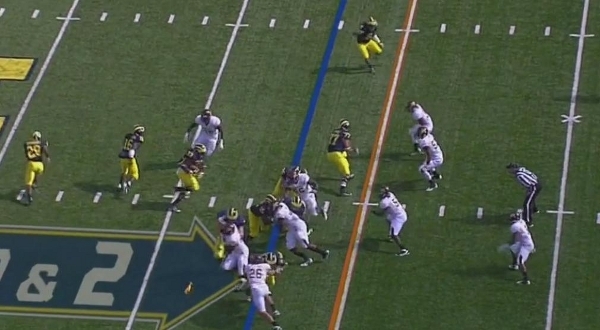 Rather than acting as a lead blocker, Fitz Toussaint takes a step to his left behind Denard. As Hopkins and Denard engage in the mesh point, you can see Toussaint swinging around to the weakside of the formation behind Denard. He will be the pitch man if Denard pulls the ball. Denard (incorrectly, I believe) hands the ball off to Hopkins for the dive play despite the defensive end crashing down on the handoff. As you can see, Toussaint is continuing to swing behind Denard. If he pulls the ball here, Denard and Toussaint are off to the races. This is how the play ends. 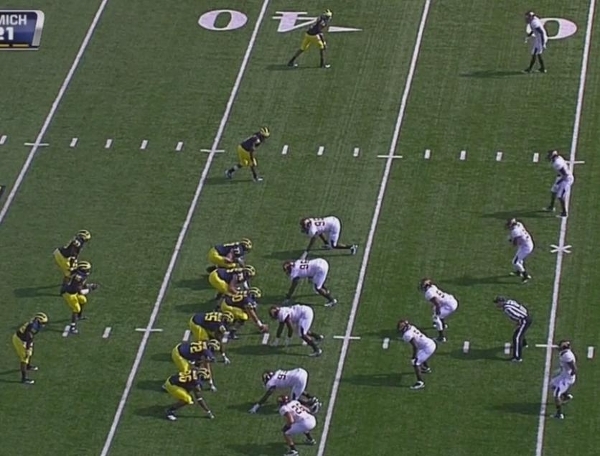 Minnesota has nine defenders in the box while Denard and Toussaint turn the corner with a blocker ahead of them. I'm relatively certain that this was a bad read by Denard, and the results bear that out. However, there's little (to no) reason to show this play were it not already installed in the offense. We should expect to see this play (hopefully with the proper read) on Saturday against Northwestern and beyond. This is yet another example of Borges adding wrinkles to the offense to catch defenses off guard. One of my biggest complaints about Rodriguez's offense last year (there weren't many) was that there didn't seem to be enough new packages/plays installed on a weekly basis. Through five weeks, Borges has shown an increasingly diverse attack while streamlining the playcalling by removing the plays that don't work (the I formation). As the season goes on, Michigan will have an increasingly diverse set of plays that could potentially make this offense just as lethal as last year's. Great work! I'm trying to maintain a healthy level of skepticism about this year but posts like this make it hard not to be super optimistic.